The Regelias are a group of irises native to central Asia, their range extending from near the Caspian Sea to the mountainous regions bordering Tibet. Their nearest relatives are the oncocyclus, which are found further west and south from western Iran to the Mediterranean. Regelias and oncocyclus together comprise the aril irises. First, a few comments on the name "Regelia". The name honors German botanist Eduard August von Regel, who was director of the botanical garden in St. Petersburg, Russia, late in the nineteenth century. Russian plant explorers of that time were very active in central Asia, seeking out new species and bringing them to attention of European botanists and gardeners. The proper pronunciation of the name is thus Reh-GEH-li-a, although most English speakers have taken to using the pronunciation Reh-JEE-li-a instead. The name should be capitalized, since it comes from a personal name. Spell-checking software likes to change the name to "regalia", which refers to Royal trappings, a blunder that one should be alert for. Regelias are similar to oncocyclus in having a large cream-colored aril attached to the seed, in going completely dormant in summer, and in preferring arid conditions. 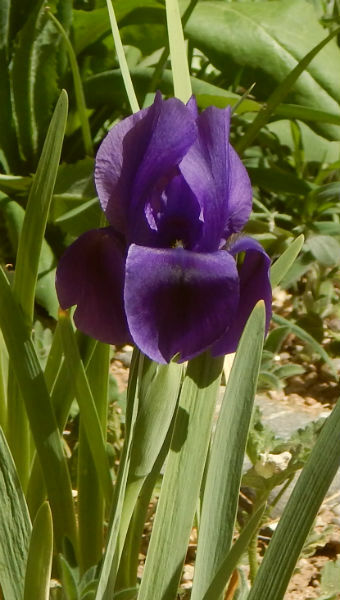 Whereas oncocyclus iris have only one bloom per stalk, Regelias usually have two. Regelias have beards on the inside of the standards as well as the falls! Whereas many oncocyclus have large globular blooms with prominent signals, Regelias have more svelte, elongated flowers, often with conspicuous veining. The two groups are interfertile, and there are advanced-generation hybrids between them. There are eight or more species of Regelias. 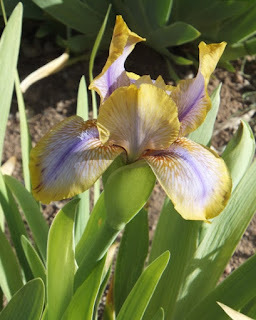 Historically, the three species grown in European and American gardens were the diploid Iris korolkowii and the tetraploids I. stolonifera and Iris hoogiana. More recently, I. afghanica and I. lineata are also sometimes obtainable. W. R. Dykes regarded Iris hoogiana as the most beautiful of all irises, because of its satiny sheen and elegant form. There are hybrids between the Regelia species, called Regelia hybrids (RH). 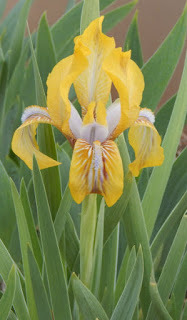 Two widely known Regelia hybrids are 'Vera' (uncertain parentage, derived from Iris stolonifera, probably crossed with Iris korolkowii), and 'Bronze Beauty Van Tubergen', a stolonifera/hoogiana hybrid registered by the Aril Society International in 2001, but in commerce since the mid-twentieth century. All Regelias are adaptable to a wider range of climatic conditions than their oncocyclus relatives. Here in northern New Mexico, mine persist better than daffodils, and get the same care. Cold winters present no problem whatsoever, as they are native to continental mountainous regions. Dampness and humidity in summer can cause problems, as the plants are dormant then and susceptible to rot. Once it was understood that the Regelias and oncocyclus irises could be crossed readily, hybridizers became interested in such hybrids, mostly as way to breed the Regelia adaptability into the often troublesome oncocycli, which are notoriously particular and difficult to grow in many climates. The firm of Van Tubergen produced a number of regeliocyclus hybrids in the early 20th century, many of which indeed proved quite durable and are still enjoyed today. Most of these were produced by crossing Iris korolkowii with oncocyclus species, and showed both Regelia veining and oncyclus dotting and signals. In current usage, the term "regeliocyclus" (RC) refers to a hybrid with both Regelia and oncocyclus ancestry that is predominantly Regelia in appearance. In practice, regeliocycli are aril hybrids with 1/2 Regelia ancestry or more. 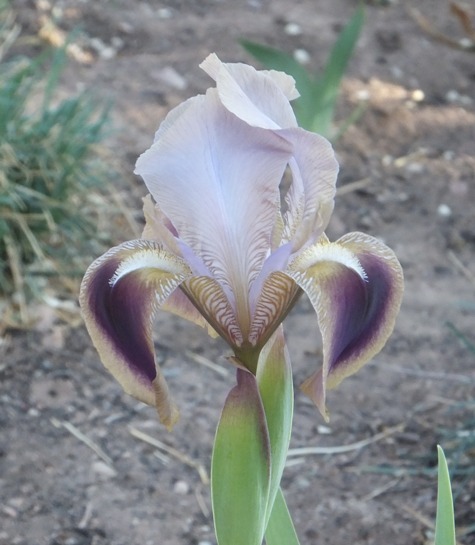 When hybridizing interest in arils blossomed in the 1940s and 1950s, the attention was almost exclusively on the oncocyclus. Regelias were thought of as "poor relations" that were not always welcome at the table. 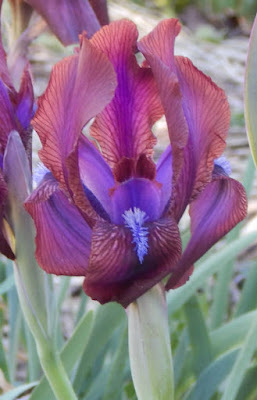 The prevailing opinion at the time was that they might be useful in breeding arilbreds that were easier to grow, or to facilitate breeding oncocyclus with bearded irises, but it was the "onco look" that was the holy grail of arilbred breeders, and signs of Regelia ancestry were frowned upon. Henry Danielson was among the first to produce and promote arilbreds of purely Regelia ancestry, launching a popular series of regeliabreds with 'Genetic Artist' (H. Danielson, 1972). These regeliabreds (RB) were derived mostly from I. stolonifera and I. hoogiana. Rather than the globular oncocyclus look expected of arilbreds at the time, they tended toward elongated, open form, showing off the often dramatic colors of the insides of the standards. 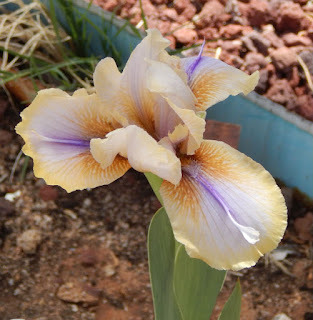 Although I. stolonifera itself tends to brownish and muted violet tones, its arilbred descendants often combine gold or yellow color with lavender or electric blue flushes in the center of the falls and standards, with similarly colored beards. These unconventional arilbreds were welcomed enthusiastically by some, but reviled by others as garish departures from the oncocyclus ideal. In the 21st century, French hybridizer Lawrence Ransom picked up the torch of regeliabred breeding, using the Regelia hybrid 'Vera' to produce the siblings 'Eastern Blush' (2002) and 'Eastern Dusk' (2010). 'Eastern Dusk' then gave the distinctive horned arilbred 'Poisonous' (Ransom, 2010). Ransom also produced a delightfully varied series of regeliabred arilbred medians, again using 'Vera' as the Regelia parent, with mixed SDB pollen. These "Vera girls" include the widely grown 'Vera-Marina' (Ransom, 1998) and 'Vera-Ruby' (Ransom, 1996). A special favorite of mine is an arilbred dwarf regeliabred from I. stolonifera X I. pumila, 'Topaz Talisman' (Jensen, 2015), from long-time Regelia enthusiast Elm Jensen, registered at 10 inches in height. Regelias and their regeliabred descendants have attracted a devoted following over the years, and have shown their great potential in adding variety, interest, and ease of culture to a collection of arils and arilbreds. Much of their full potential, I believe, is still untested. For decades, they have suffered from unfair comparison with their more popular oncocyclus and oncobred cousins. 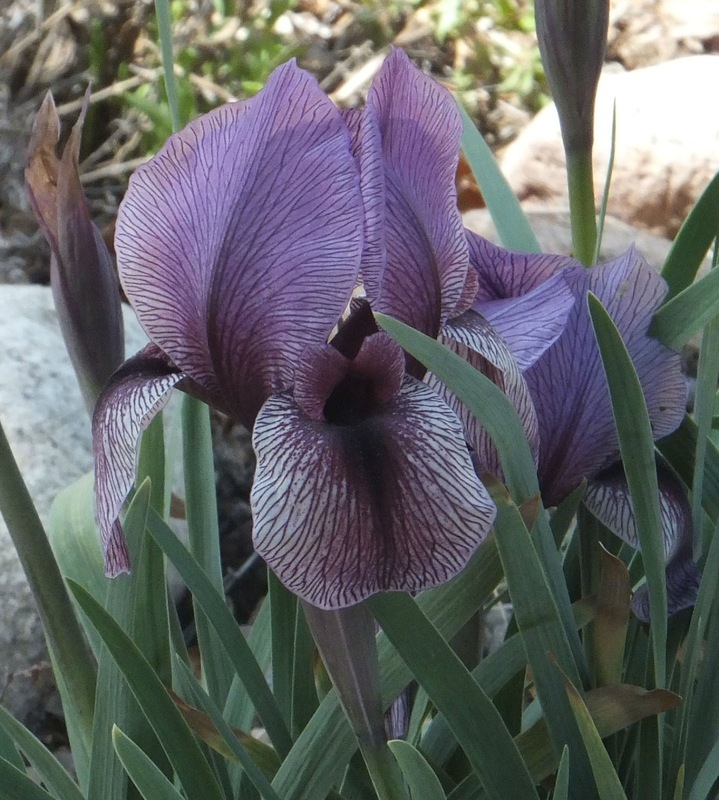 As more growers and hybridizers move away from the prejudices of the past, the Regelias and regeliabreds may at last come into their own as fascinating and beautiful types of iris in their own right.